Some project teams want to have their team members enter in the number of work hours that are left on a task. No problem! First, you must make sure your Project Insight settings are enabled to capture that information. A PI administrator needs to go to Administration, Project Settings and make sure that the check box 'Work Percent Complete Types' is unchecked.Then click save. Now, when team members go to update tasks from the home screen or dashboard, they will see the field for 'remaining' and can input the number of hours left to perform the task. 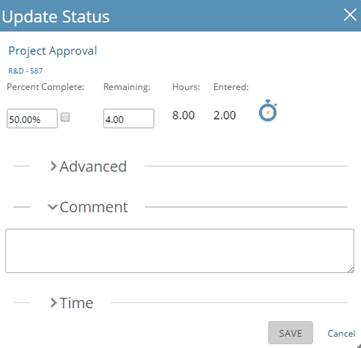 This will auto-calculate the percent complete which will provide project managers with the correct health status for each task.